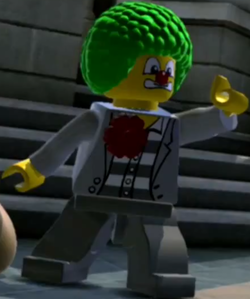 Clown Robber Max is one of the characters in the video game LEGO City Undercover. He has never been physically released. Max is one of the clown robbers that robbed the Cherry Tree Hills Bank. He tried to escape in a armoured truck, but he was arrested by Chase McCain. Facts about "Clown Robber Max"